Caramel apples are probably my all time favorite Fall treat and Shelly is trying to kill me with all of the fun caramel apple flavored treats she has been sharing. The most recent is caramel apple ice cream. If where you live is anything like here, Fall may be coming, but the temperatures are still over 100. This cold fall dessert is a great way to enjoy the flavors of Fall while cooling off from the still summer like temperatures. 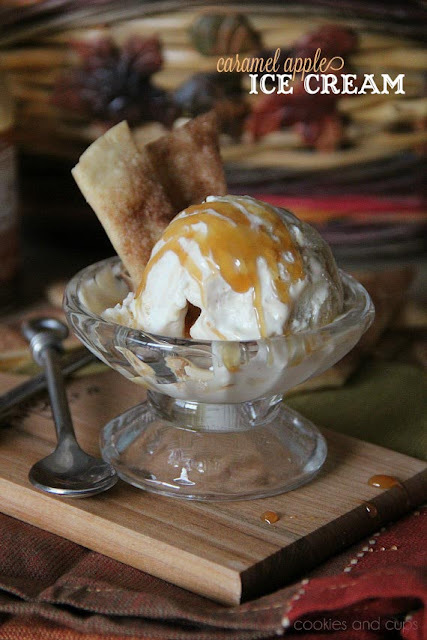 And if you aren't in the mood for ice cream, check out her caramel apple pizza, caramel apple popcorn, and who knows what she will come up with next over at Cookies & Cups. Aw man, this looks so yummy! Too bad I'm on a blankety blank diet!